As the annual spring cycle of melting and freezing approaches, it seems like a good time to consider the consequences of travelling on a snowpack in the throes of this natural cycle. A mid-winter thaw, one of several this season, led to a tragic accident on Mount Washington in mid-February. Two days after the accident, snow conditions changed dramatically from a long sliding fall hazard to an avalanche hazard with Considerable (3 of 5) and High danger ratings (4 of 5). Initial notifications of law enforcement, family members and others who need to know about such things occurred over the next two days. And then an unusual silence made it clear that the usual clamor for details from media outlets was missing. A widespread broadcast of a long sliding fall hazard when the actual hazard was an avalanche risk would have been confusing and misleading to the public so we felt that holding onto the analysis until that long sliding fall hazard re-emerged would be a better course of action. Of course, that didn’t account for the current hunger of some local outlets to fan the flames of conspiracy, but that’s another story not really worth delving into. While the primary goal of analyzing incidents and publishing a report is to provide an opportunity for people to learn from the mistakes of others, there are potential negative outcomes inherent in sharing these analyses. In any incident analysis, particularly one involving an unwitnessed accident, inaccurate assumptions about the factors leading to the incident are almost inevitable, and can sometimes outweigh the potential educational value of sharing any such reports at all. Further, in the case of any accident, especially one with no one around to tell the tale, a certain level of hubris is implied in the process that can often lead to passing judgment on the already punished, thereby missing the intent of the analysis. While reading about the details surrounding an incident can serve to educate certain readers about certain situations, other readers may only underestimate their own vulnerability to a hazard by making erroneous assumptions about causal factors. Often, it is human nature to to keep these factors at a distance and to attribute an incident to factors like equipment choice, lack of knowledge, or misapplication of skills – tangible and reparable mistakes. These assumptions are fundamentally flawed in that they fail to account for the risks which are inherent in these activities. To assume the mistakes that claimed the life of the man in this report were somehow avoidable, fails to acknowledge the reality that any of us could make a similar mistake with the exact same outcome tomorrow, or next week, or next year. High stakes activities, including many daily activities, require not only a functional set of hard skills but an equally valuable set of soft skills to succeed. History has proven it impossible for any human to sustain either of these skill sets 100% of the time, or indefinitely. Central Gully is in the center of the photo and is the most striking feature in Huntington Ravine when seen from a distance. The jumble of boulders beneath the obvious cleft is known as The Fan. The narrow section of the gully is the crux of the climb due to it’s angle of around 50 degrees. It is generally a frozen waterfall when not covered in snow in late season or snowy winters. The red line shows the approximate route of Jeremy’s fall. The green arrow marks the location of a rock which Jeremy may have struck during his slide. The red arrow shows where he came to rest. 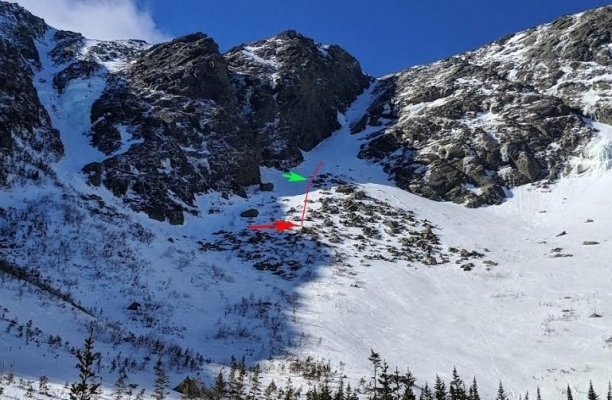 On Sunday, February 10, 2019, a 37 year-old male succumbed to injuries sustained during a fall in Huntington Ravine on Mount Washington. Jeremy Ullmann was attempting to climb a moderately difficult snow and ice climb called Central Gully. He was known to be an experienced and skilled rock climber but a novice ice climber with experience hiking and climbing peaks around the world. Jeremy and his climbing partner departed from Pinkham Notch at 7:30 a.m. They split up at the junction of the Winter Lion Head Route and Huntington Ravine Fire Road with a plan to meet at Pinkham Notch Visitor Center at 4:00 p.m. Jeremy’s partner continued up the Lion Head Winter route and reached a high point at Split Rock before descending to Pinkham Notch due to wind and cold. When the Central Gully bound climber failed to return at 4:00pm, his partner alerted the AMC Pinkham Notch Visitor Center front desk staff at approximately 4:15pm. Following an interview to obtain pertinent information, AMC SAR staff were notified along with preliminary alerts to Hermit Lake and Harvard Cabin caretakers. At 5:36pm, the Lead Snow Ranger was notified of the developing search. The process of notifying responding SAR resources was initiated. U.S. Forest Service Snow Rangers dispatched the Harvard Cabin caretaker who began the search at approximately 6:10pm to look for the missing and possibly injured or lost climber. Local volunteer SAR teams soon joined the Snow Rangers with a plan to search the terrain above Huntington Ravine as well as below the route. At approximately 7:45p.m, the climber’s body was found below Central Gully in Huntington Ravine, in the boulderfield known as the Fan. The deceased’s body was lowered in a rescue litter about 550’ with ropes, brought via snowcat to Pinkham Notch and released to the Coos County Assistant Medical Examiner who notified the State Police of the death. The paragraphs below highlight some factors which we believe contributed to this particular incident. The risks involved, however, are not unique to this incident, but are risks which every experienced mountaineer or skier, upon honest reflection, has grappled with at some point, if not numerous points, in their tenure. According to information provided by his hiking partner, Jeremy had been eager to do an alpine ice climb in Huntington Ravine for quite some time. His partner, having hiked Mount Washington in winter numerous times had expressed concern to Jeremy that conditions were not favorable. Both had read the avalanche forecast which had highlighted long sliding falls as the predominant hazard for several days. Icy surface conditions had developed following several days of warm temperatures and rain the previous week. The wet snow then froze which created very slick, hard and icy snowpack. Weather conditions on the day of the climb were seasonably cold, -11F on the summit rising to -4F with strong winds (50-60 mph) in exposed areas and likely around 30-40 mph in the more wind sheltered Ravine. These weather conditions are challenging but ascents of both technical and non-technical routes are not unusual in those conditions. Based on typical hiking times, it is likely that sometime between 11:30 a.m. and 12:30 p.m. the victim fell on the steep, icy snow surface on the approach to Central Gully and slid approximately 300 feet on the slope into the boulder field known as the Fan. A slope clinometer confirmed that the slope angle where the stumble and ensuing fall occurred were 35 degrees, or about the angle of an advanced ski run at a resort. Gouges in the snow indicate a strong effort to arrest the fall with an ice axe were made, though the very hard and icy surface snow provided such resistance to this effort, as well as a low friction sliding surface, that this attempt ultimately failed. Jeremy was not wearing his helmet at the time of the fall. Due to the relatively low angle slope, the fact that he had not yet donned the helmet is an easy error to make. Helmets can complicate layering of hats, balaclavas and hoods and may have interfered with the goggles which Jeremy was wearing at the time of the fall. While helmet use is recommended in any climbing or skiing situation, it is also known that helmets offer limited protection from large falling objects or from impacts associated with high speed collisions. In this case, the injuries sustained may have been reduced but would have likely remained lethal given their extent and location. As to what actually caused the fall, no one can ever know with certainty. Jeremy was very fit and in excellent health overall. He was not overdressed, and he had a mostly empty water bottle and some energy bar wrappers, from which you could surmise that he wasn’t dehydrated or lacking fuel. Anyone who has climbed a moderately steep (35-45 degree), hard snow or ice climb in crampons can attest to the challenge of maintaining the proper foot position for keeping crampons engaged while at the same time keeping feet and calves from fatiguing. Skill using an ice axe and crampons in soft snow is forgiving and as simple as climbing a staircase kicked into the snow. When surface conditions are more like boilerplate steel, a combination of flat footing and front-pointing is often used to maintain security on the slope as well as efficiency in upward progress. Experienced snow and ice climbers also can attest to the fact that crampons points catch a pant leg, a gaiter or loose strap with some regularity and may occasionally even pop off unexpectedly if not perfectly fit to the boot. In this instance, Jeremy’s crampons were securely on his feet but the crampon strap and buckle used to secure the heel bail were on the instep of the foot. While easier and more intuitive to put on, this configuration creates one more item on the long list of potential trip hazards. The icy conditions that day made for relatively secure climbing since the hard snow surface yielded to sharp points to provide secure purchase. These hard and cold conditions may have also warranted the use of technical ice tools to increase security, especially when forgoing the safety of a rope and belay. It seems clear that Jeremy hadn’t reached the bulge of ice that is the steepest crux section of the route but if he had, the two mountaineering axes, one of which was a superlight aluminum mountaineering axe, would not have provided much security. Mountaineering axes, with their drooping curved pick, do not allow for a hard swing like a hammer and secure pick placement into the ice. A mountaineering axe is generally sized and designed to plunge the shaft into snow while grasping the head of the axe like a cane. The snow this day was too hard to plunge the shaft securely into the snow and the wrist leashes tied to both axes indicate that Jeremy may have expected to use them in the manner used to climb more vertical ice. While this is speculative, it was reported that Jeremy had not climbed ice. Lacking that experience or training, he may not have understood the critical difference in design and function between technical and mountaineering axes. The significance of a long, sliding fall and danger of a small stumble on seemingly benign terrain cannot be overstated. If you have not practiced self-arrest with an ice axe you should. If you have practiced, you know that the effectiveness of this skill is limited in the hard icy snow you’ll encounter in the mountains today. In these conditions, very careful movement is necessary to prevent a fall from happening in the first place. Long sliding falls, also known as slide-for-life snow conditions, are common in the mountains and by far the most common cause of accidental death in the Presidential Range. 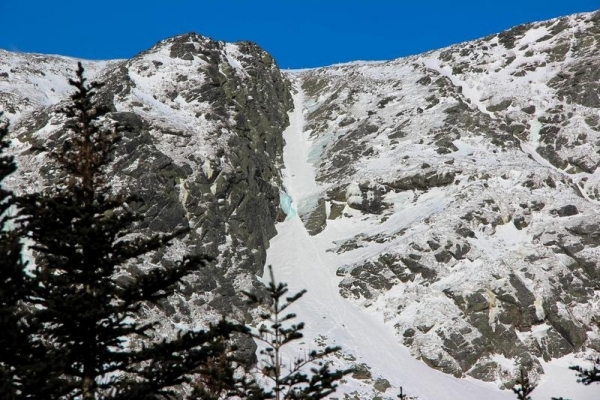 When snow begins to melt by sun or rain and freezing temperatures return, the stage is set for an unforgiving surface that has claimed at least a dozen lives from sliding falls in “non-technical” terrain in the Presidential Range. There are many ways to reduce your risk from this hazard besides abstinence. Matching your skills to the terrain and to the snow and weather conditions, assessing the slope below you for obstacles, taking courses to refine your skills, or simply choosing a lower risk but equally gratifying option on your scheduled day off in the mountains are among them. High wind, low visibility and very cold temperatures kept Snow Rangers away until February 12 when they estimated the length and trajectory of the fall based on tracks and marks in the snow. Note the relatively shallow slope angle. Not very steep but steep enough, in the right conditions, for dangerous sliding falls or avalanches.